With Community Benchmark as your guide, learn the new possible and discover hidden sales opportunities. The first and only winery DTC software to simultaneously help you and your Community. We guarantee to identify the most immediate and impactful ways to grow your DTC sales. Community Benchmark is absolutely committed to helping your sales staff work smarter, not harder. In the destination wine business, a win for your neighbor is a win for you and your destination. Community Benchmark’s data-pooling algorithms and unique sharing methods prove true the old saying that a rising tide lifts all boats. It’s simple: we process your data and display it back to you, highlighting your biggest opportunities for growth. Being able to quickly review your most important business metrics over time is important. Understanding how your metrics compare with other wineries like yours is critical. Looking at your own numbers by themselves will only take you so far. 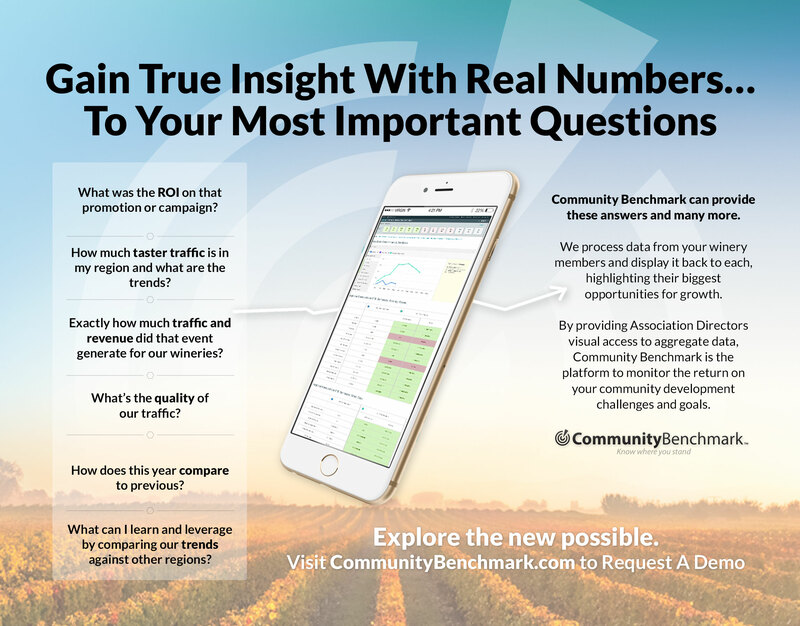 Community Benchmark provides an exclusive layer of data-driven intelligence that reveals big opportunity. We alert you to crucial movements in your key performance indicators and just as importantly, those of your destination. No more wondering which sales goals to focus on, or guessing how high to set them. Community Benchmark shows you exactly what’s possible in your location. Your team will truly understand your sales performance and focus your resources to achieve marked sales improvement.